Optimum Moving makes all moves in and out of New Jersey easier to handle. If you need to move in or out of Vineland, we are the moving company you can trust for all your residential or commercial moving needs. We believe that moving does not need to entail an arduous process. With sound planning and flawless execution by our talented moving team, all the stresses and hassles associated with moving can be eliminated. Vineland is a city located in Cumberland County. It is one of the three principal New Jersey cities and was formed in 1952. Vineland got its unique name from the plans of its founder to use the land for grape cultivation. Out of all the municipalities in New Jersey that have being labeled as a city, Vineland has the largest area. What’s more, Vineland borders Millville, Deerfield Township and is less than 40 miles away from the Atlantic Ocean. 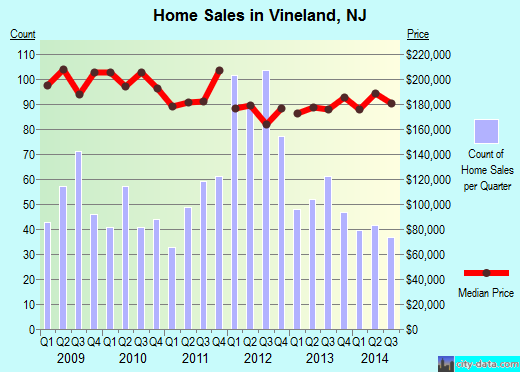 In Vineland, the median price of the houses here costs about $161,433. A majority of the residents living in this city opt for a house that has at least two or three bedrooms. More than 60% of the 61,050 population here stay in the city for long time durations which is five years on average. Renters in Vineland choose to live in their rented houses and condos for an average of two years while property owners choose to stay in for an average of 15 years. When you choose Optimum Moving to be your relocation partner, you will instantly experience our passion and commitment toward moving. When it comes to moving in or out of Vineland, our professional staff members are able to operate the latest moving equipment. We have many years of experience moving bulky items such as chandeliers, so anything bulky such as your 60-inch flat panel TV is in good hands. What’s more, we will safely remove them at your old location and have them installed in a jiffy, once they arrive at your desired destination. We provide coverage such as Full Replacement Value and Basic Carrier Liability too, to ensure you enjoy complete peace of mind during the move. Want to learn more about a Vineland Move?